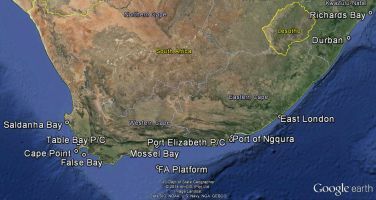 Ocean waves are monitored continuously at Nqura in South Africa. Detailed information is directly available in real-time, for operational purposes, to NPA (Port of Ngqura). The data is gathered with a directional Datawell Waverider buoy, situated at 33°50'00"S, 25°43'00"E in 21 m water, about 2 km off the tip of the breakwater. Measurements are processed on board, and transmitted to a shore station every half hour. The analysed data is then downloaded in near real-time to the Stellenbosch office of the CSIR, where it is stored in a database.